I ALWAYS use my pump clip (unless I'm in a dress and rockin' my awesome thigh holster). This morning, in my usual ohmygodhurryhurryRUSH! spaz to get out the door on time, I completely forgot to put on the clip. And lemme tell ya, my pump hates to be all warm and snuggly close to my skin. Every time I use my holster or tuck that puppy into a pocket, my BGs float up and stubbornly refuse to budge out of the 140s range. 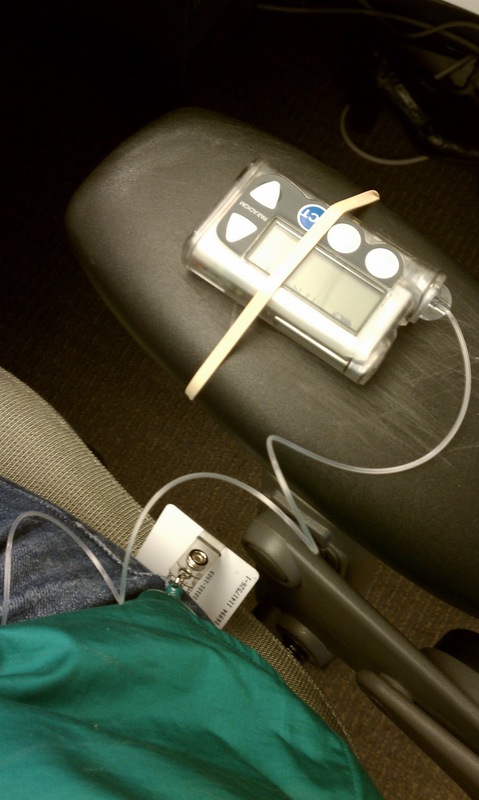 Why yes, that IS a pump rubber-banded to the arm of my chair. :D This is too cute! I like it.